Once you've clicked on the 'Pop-up Windows' section, click on the 'Block and Notify' drop down next to any sites with simplesalon.com and select 'Allow'. 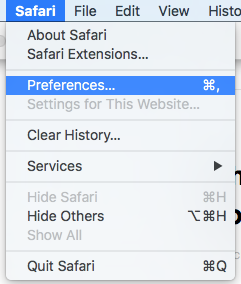 You can also change the 'When visiting other websites' drop down to 'Allow' if you'd like to allow pop-ups for all sites. This will ensure that all sites will allow pop ups. Once you have completed the above process, see how you go printing the reports or clicking on the 'Buy Credits' link. Still not working or your screen looks different? Once you've clicked the 'Security' icon, un-tick 'Block pop-up windows' which will update the settings. This in turn will allow the windows for reports to open and the 'Buy Credits' link to work. Feel free to send us your questions anytime from your Help & Support page via Submit a Request. Are client's past appointments coming up in POS?